Take a look in your horse's mouth and you’ll see a lot of teeth in there. 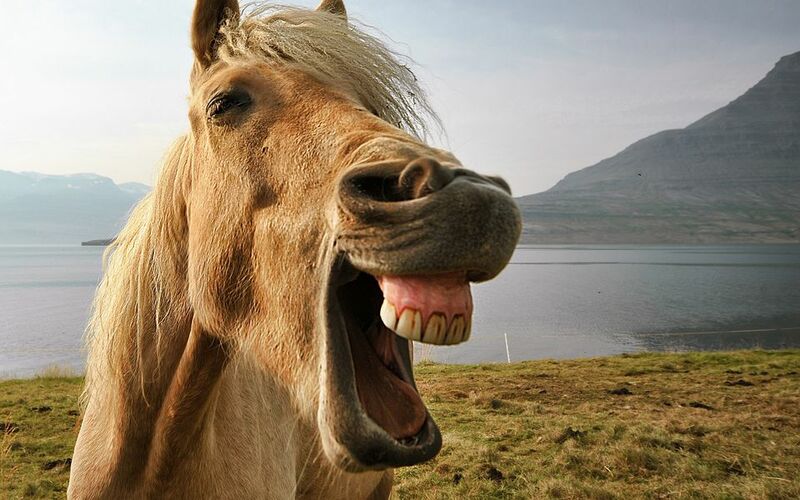 On average, horses have between 36 and 42 teeth. The number is dependent on the gender of the horse, and whether or not the horse develops extra teeth along the bars of its mouth—the empty space between the front teeth and rear teeth where the bit sits. Your horse also has a number of different types of teeth. And, throughout its life, it will have two different sets of teeth, just like humans. Specific wear and growth patterns can help you determine the approximate age of a horse. The deciduous teeth, or milk or baby teeth, are the first set of teeth that grow in a foal's mouth. These teeth may be apparent when the foal is born. Shortly after the young horse’s second birthday, these teeth are pushed out by the permanent adult teeth as they grow in. There are 24 in all and they are usually replaced entirely by the time the horse is about 5 years old. Occasionally, a young horse may need help shedding baby teeth. The caps, as they are called, may not fall out as they should, and may have to be removed by a veterinarian or equine dentist. The permanent or adult teeth continue to grow for most of the horse’s life. These are the ones we look to when we want to learn the approximate age of a horse. When a horse gets really old, the tooth growth ends, and the horse may develop gaps where teeth fall out. This can lead to problems like weight loss and quidding. As the foal matures to 4 or 5 years of age, some horses may get extra teeth in the inter-dental gap that we call the bars of the mouth. Canine and wolf teeth are slightly more common in stallions and geldings than in mares. They may only grow into the upper jaw, or they may grow in both the upper and lower jaw. Because these teeth can cause discomfort, especially when holding a bit, they can be removed. These teeth can sit beneath the gums in some horses, be quite small, or get quite pronounced. These teeth tend to be smaller in mares than in stallions or geldings. Your horse’s front teeth are called incisors. These teeth that efficiently clip the grass as it grazes. These are also the first teeth to appear as the milk teeth grow in and the first to shed as the permanent teeth push through. 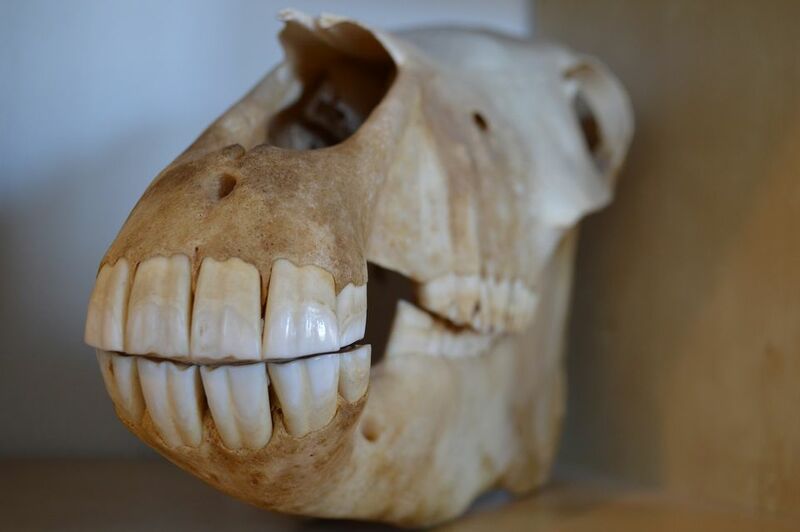 These teeth are the easiest to see, so it’s from these that a horse’s age is estimated. These teeth can continue to grow to replace the gradual erosion caused by cropping fodder that has grit and other abrasives. Incisors can also be damaged by blows that can crack the tooth, just like human teeth can be damaged. All horse teeth are deeply rooted, and the roots can curve well back into the jaw bone. Horses have six incisors top and bottom for a total of 12. The premolars or cheek teeth sit directly behind the bars of the mouth. These teeth help to grind food before it is gathered into a bolus at the back of the throat and swallowed. The cheek teeth are wider than the incisors. A horse moves its jaws sideways to grind grass, hay, or grains. These teeth convert fodder like grass or hay into a 1/2 inch long. If you see pieces of grass or hay in a horse’s manure that are longer, it could indicate a dental problem that is making it hard for your horse to chew properly. All of your horse’s teeth grow about 1/6 inch per year. The amount of wear depends on the type of soil the horse is grazing on and the type of fodder, as well as the health, habits, and genetics of the horse itself. Premolars and molars are very deeply rooted in the horse’s jaw bone. In the lower jaw, these teeth extend to the bottom of the bone. There are a three pre-molars and three molars top and bottom for a total of 24. Very rarely, a horse may have an extra molar. Incisors are used for clipping grass and picking up food. Premolars are used for grinding it all up before the horse swallows. But teeth have two other uses. Teeth can be used as a weapon. A horse may nip if annoyed or may bite hard if it is defending itself from or attacking other horses or predators. Horses may play bite and this is common in youngsters. Teeth are also a grooming tool. They can be used to scratch an itch or may be used in social grooming referred to as allogrooming. This is when horses nibble on each other along the top of the neck, withers, back, and hindquarters. Some horses are clever at using their teeth and lips to unfasten door latches or untie knots in ropes or may enjoy carrying objects around with their teeth. Horses are prone to several tooth problems. These problems can result in poor health, weight loss, difficulty wearing a bit, and behavior or performance problems when ridden or driven. Horses can have cracked, loose, or broken teeth from an accident. Baby teeth may not shed properly and could need the attention of an equine dentist or veterinarian. Uneven wear can cause sharp edges and hooks that require smoothing down to prevent irritation to the inside of the cheeks or tongue. Some horses have misaligned jaws that can be undershot or overshot, also called parrot mouth, which can cause wear and chewing problems. Teeth can become infected and abscesses in the jaw can form if debris or plaque cause problems. Because the roots of some of the molars extend near the sinus cavity, some infections can appear to be sinus problems. The yellowish or brownish color of the teeth is normal. The teeth do not stay pearly white because they become stained by the food eaten. However, the gums should appear healthy pink. Any change of color can mean a health problem or a specific dental problem. Horses need regular dental check-ups just like people do. The frequency that a dentist or veterinarian needs to check a horse’s mouth depends on the horse. Generally, once a year is sufficient. But, some horses because of ongoing problems, or the shape and size of its mouth may need more frequent checks. When your horse’s teeth are checked, its age will be taken into account, since some problems such as caps, hooks, and points are related to age. Your horse may need a bit seat, or even need teeth removed. And, when an older horse starts having problems grinding food due to worn or missing teeth, a veterinarian can help you determine the best diet for your horse.